An intimate show put on by Elton John for the BBC will make is American television premier on Saturday, October 5 via PBS. Elton John in Concert was taped at the BBC Radio Theatre in front of a lucky audience of 300 selected from over 79,000 ticket requests. The show includes two songs from Elton’s latest album, The Diving Board, along with eight of his greatest hits. As always with PBS shows, check with your local station to confirm air time. R.E.M. Reveal New Album Will Be Called "Collapse Into Now"
Best-selling rock band R.E.M. have revealed that the title of their 15th studio album will be Collapse Into Now. The album will be released in Spring 2011 by Warner Bros. Records. BBC Radio 6 broke the news on its Twitter feed after R.E.M.’s manager Bertis Downs revealed the title at the In the City conference. 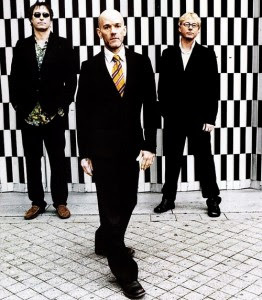 R.E.M., which is singer Michael Stipe, guitarist Peter Buck, and bassist Mike Mills, re-teamed with Grammy Award-winning producer Jacknife Lee, who produced the band’s acclaimed previous album Accelerate, to make Collapse Into Now. Lee is also noted for his work on albums by U2, Snow Patrol, The Hives, and indie stalwarts Kasabian, Editors, Aqualung, and Bloc Party. R.E.M. and Lee recorded the album in New Orleans at the Music Shed and in Berlin at the famed Hansa Studios, where several legendary albums, including David Bowie’s Heroes, U2’s Achtung Baby, and Iggy Pop’s Lust for Life, were made. Additional recording and mixing were done at the venerable Blackbird Studio in Nashville. Collapse Into Now is the follow-up to 2008’s hard-charging Accelerate, which debuted at No. 2 on the BillboardTop 200 album chart, topped the Alternative, Rock, Digital, and Internet (physical goods) charts in the U.S., and debuted at No. 1 in Canada, the U.K., Ireland, Denmark, Norway, Switzerland, and the Czech Republic. It spawned three hit singles “Supernatural Superserious,” “Hollow Man,” and “Man-Sized Wreath.” The band also released a two-CD live set, entitled R.E.M. Live At The Olympia, last October. On October 26th, 2010, New West Records will release R.E.M. Live From Austin, TX — a DVD that contains the full live performance of the band’s concert for PBS’ Austin City Limits television series, plus three songs that didn’t air on the original broadcast. The 17 songs, including several from Accelerate and such classic hits as “Losing My Religion” and “Man On The Moon,” have been re-mixed and re-mastered in LPCM stereo and DTS-HD 5.1 Surround Sound.